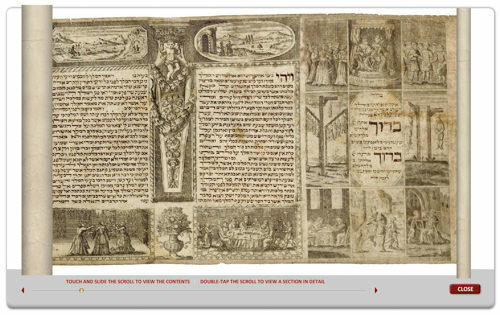 This prototypical scroll is distinctive for its detailed illustrations of the Purim story and for its inclusion of striking representations of midrash (rabbinic commentary). The specificity of these scenes reveals knowledge of both the Bible and its interpretations. One such illustration depicts Vashti being strangled by two women. The text of the book of Esther states only that the queen was never to appear again be- fore the king. While the midrash specifies that she was executed, there is no mention of the method. A second midrash is depicted in the scene illustrating the manner by which Haman determined the date for the destruction of the Jews. Rather than choosing lots, as described in the Bible, Haman shoots arrows at a zodiac wheel. Yet another illu- stration, the Wedding of Esther and Ahasuerus, employs the established Christian imagery of the Marriage of the Virgin. This megillah belongs to a set of scrolls that share a printed border containing similar biblical scenes under the text columns. They differ, however, in the choice of subjects that appear above the text. In one group, landscapes are depicted, while in another, portrait busts of characters from the biblical story are portrayed. The place of origin of all of these scrolls, which were widely disseminated throughout Europe, has been debated. The figures depicted in this scroll wear the clothing of wealthy Ashkenazic Jews; the flat, round hat known as a barrette, the sarbal (festive cloak) and the Judenkragen (ruffled collar) point to a Western European milieu. Based on an example printed on paper bearing the watermark of C & I Honig (a Dutch paper manufacturer), Adri Offenberg has definitively localized these scrolls to Amsterdam. He further posited that the Proops Brothers, prominent Amsterdam printers, most likely published the work. The opening panel features a minute inscriptionby the scribe Jacob of Berlin written on the step of the throne in the upper middle panel. 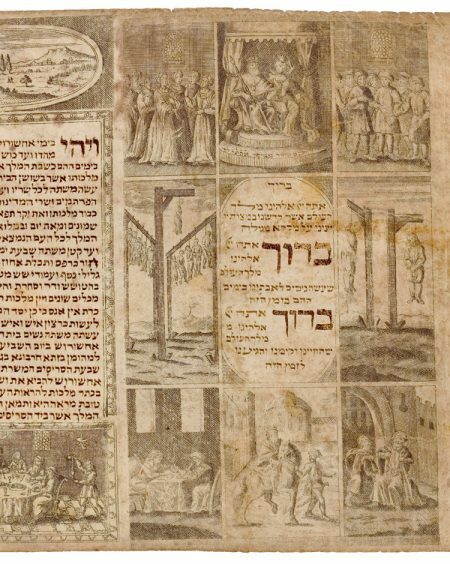 The date of 1701 is indicated by emphasizing the Hebrew letters aleph, samekh, and tav in the word “Esther.” This scroll is the earliest known example of the group of Amsterdam printed borders, which continued to be produced throughout the eighteenth century. Benjamin 1987, pp. 270–273; Christie’s Amsterdam 2002, lot 390.